HBSE 10th 12th Result 2018 - Haryana Board Registration for March 2018 Exam Started Now Apply Online Registration at www.bseh.org.in - HBSE 10th 12th Class Result 2017 - HBSE 10th/12th Class Re-Appear/Compartment/Improvement/Rechecking/Reevaluation Admit Card/ Exam Date Changed 2017 Check New Exam Date at www.bseh.org.in - HBSE 10th 12th Class Re-Appear/Compartment/Rechecking Admit Card/ Result 2017 – Haryana Board Secondary Senior Secondary Compartment/ Improvement Result 2017-18 Download at www.bseh.org.in. On 09.09.2018 - HBSE 10th/ 12th Compartment Mark Sheet for Exam July 2018 will be distributed to the respective schools on 10.08.2018 & 11.08.2018. Note: In case any candidates will have a boost of 10% marks, half of the application fee (means 500/- out 1000/- or 400/- out of 800/-) will be returned to the candidate's bank account. So it is mandatory to fill your account number while submitting re-evaluation form. 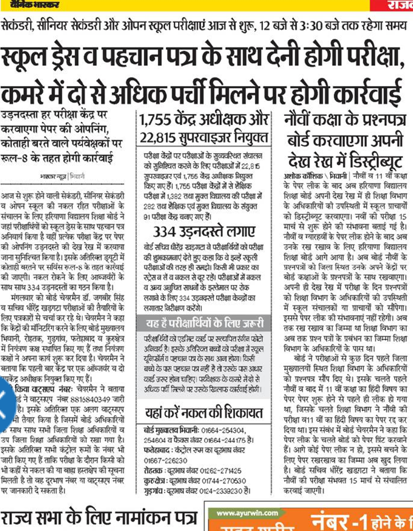 The good news is that Haryana Board of School Education has declared the result of Re-checking and Re-evaluation result on official website at www.bseh.org.in. The candidates can check their case from the link in the table given in the end of the page. The good news is that HBSE has released date sheet for Compartment/ Improvement/ Additional Schedule for the examination to be held in July 2018. The exam will be conducted on 14th July 2018 for both 10th & 12th Class. The online admit card will be available about a week before the date of exam. · From 25 May 2018 - 13 June 2018 - Rs. 700/- without late fee. HBSE 10th 12th Rechecking Re-evaluation Reappear Compartment Improvement forms will be available within 3-4 days after the declaration of result. The result has been declared on offcial website. The candidates can check their result by entering their roll number or name in the columns provided on the page. 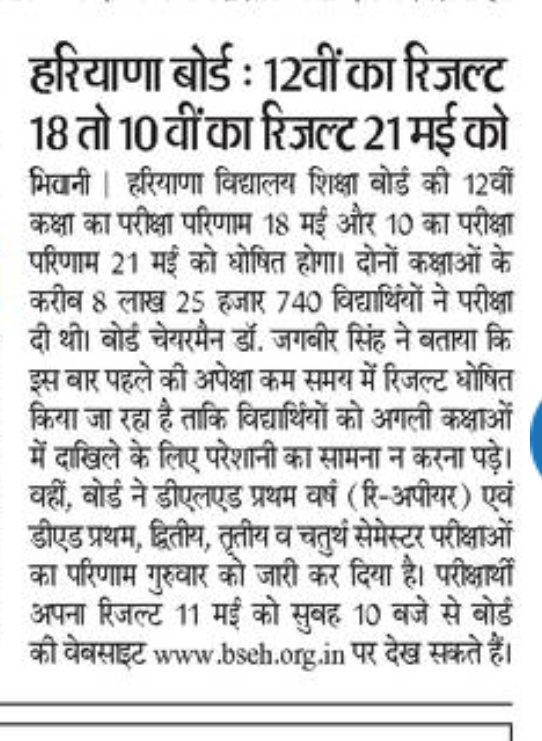 Haryana board of School education head uploaded the list of UMC registered by the various school in 10th and 12th Class exam held in March 2018 at various exam centres across the state. Those candidates who have registered UMC in any of Exam are hereby informed that they are personally visit on hearing of UMC from 18th April 2018 to 21st April 2018 to the Haryana board, Bhiwani. Registration has been sent to the respective school of the candidates and the list provided on the official website www.bseh.org.in. In case any candidate do not receive information regarding UMC, they can contact to UMC Room No. 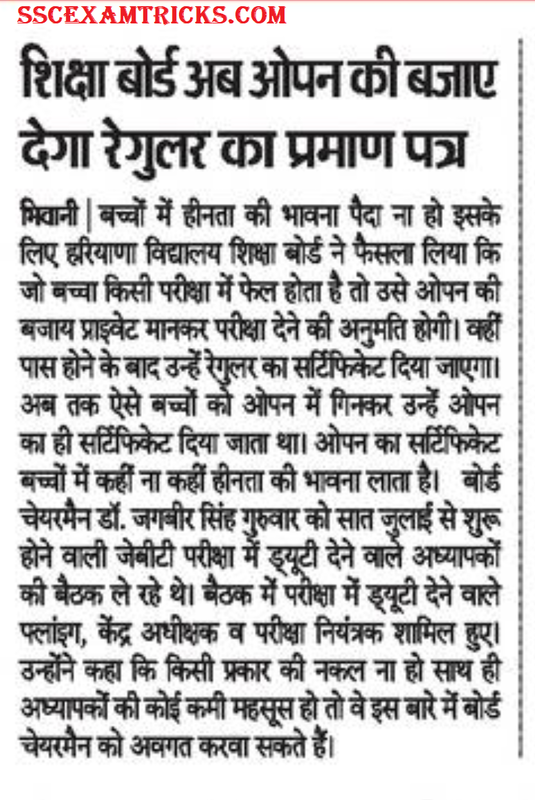 71, HBSE, Bhiwani. 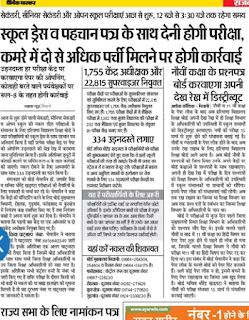 Latest News (24.05.2018) - The news is that Haryana Board may conduct re-appear examination for HBSE 10th 12th Exam for Re-appear/ Compartment Candidates in the month of July 2018. 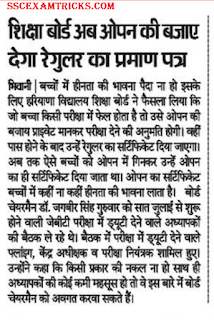 It is in the news that HBSE will uploaded 10th/ 12th regular roll number/ admit card may be available on 27.02.2018. The admit card for HBSE Re-appear has been available on 26.06.2018. Candidate Could Not Allow For Exam Without Signature Chart. 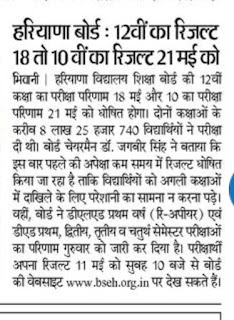 Registration Schedule for Haryana Compartment Candidates 10th and 12th.